So excited to be back posting on The Blended Blog today! 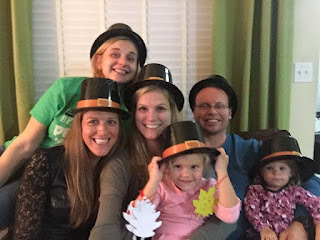 During this season of thankfulness and gratitude, I thought I would share with you a tradition I started with some of the people I am most grateful to have in my life. Last year my best friends and I began celebrating Friendsgiving. Friendsgiving is so much fun and a hoot to put together! Here's a peek into my Friendsgiving! Mel and Kerri are my two best friends. Kerri is the only one of us who is married and has kids. So our Friendsgiving celebration consists of the three of us, Kerri's husband (who pretty much knows he's inherited Mel and I as wives, too!) and her two young daughters. This past Saturday we had our 2nd annual celebration. We have now gotten into a groove and are making the day our own. Last year, I hosted at my house. The same was true this year and that will continue. My home has an open floor plan, so everyone is together, regardless of where we are. The girls love the change of pace that Aunt Katie's house provides, too. Mel is the cook and coordinator of the meal. Mel enjoys cooking...more so than Kerri and I! She makes a mean turkey! And great pies too! But we do contribute dishes. The party would not be complete without Kerri's Mexican dip! We are very aware that it's not a traditional Thanksgiving app, but somehow, not having it (served in her Christmas bowl...LOL), something would definitely be missing from the day. Kerri also makes the sweet potatoes. And I make the classic green bean casserole, and a pumpkin dessert dip. This year I was kind of a fail though, because I forgot the apple dip! LOL...yes, last year we had Mexican and apple dip apps. Now that I am writing that combo down and thinking about it, I'm not sorry, I forgot it!! But I was so excited that the Fall Sangria was a hit!!! Being the teacher, I decided we needed crafts and games for the kids. Which we then complete while the dishes are being done...so I'd say that's a win for me!! Addie loves doing them and that just makes me so happy!! Addie, who's 4, also enjoys the Turkey Hunt and this year Brinleigh, who's one, was able to join in on the coloring. The Turkey Hunt around the house is Addison's FAVORITE!! Something that added to the fun this year was Friendsgiving Karaoke!! If you read my blog, over at The Mishaps and Mayhem of a Solitary Life, you've probably heard me declare my love for my ChromeCast. It was so fun to cast lyric videos to the TV and sing along to them. Addie LOVED Albuquerque Turkey (87 times!) and the Frozen songs. Mel, Kerri, and I enjoyed Part of Your World from the Little Mermaid. Chris had a good laugh at our expense! We sang...we danced...we laughed...we had fun!! It was a day of good food, great company and a million laughs!!! These days it's rare that we get to see each other too often so I am thankful for our dedicated Friendsgiving day to be able to spend time together. My friends are family to me and I am so grateful to have them! A few more pictures of this year's festivities! Do you celebrate or have you thought of celebrating Friendsgiving? Let me know in the comments below!! Wishing you all a blessed Thanksgiving with all your favorite people!! Katie is a regular contributor to The Blended Blog. When she's not blogging, she's laughing. 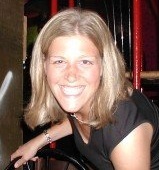 She spends her days as a teacher-librarian to "her" 300 kids in her hometown of Long Island, New York. She enjoys online shopping, fun nights out with friends, or in, binge-watching Netflix and drinking wine. Follow along with her at The Mishaps and Mayhem of a Solitary Life.